Wellington, FL (October 25, 2011) – Nancy Later's beautiful smile and positive attitude at the Wellington Classic Dressage Autumn Challenge helped the accomplished dressage trainer take home the Premier Equestrian Sportsmanship Award. Sponsored by Premier Equestrian, a leading supplier of dressage arenas, horse jumps, arena footing and stable accessories, the Premier Sportsmanship Award is awarded to a rider who displays a high level of sportsmanship during a show. 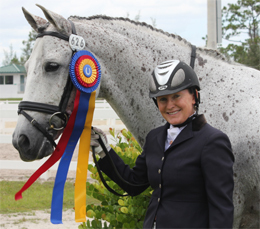 Later, who operates Nancy Later Dressage in Loxahatchee, Florida, thanked Premier for sponsoring the award and commented on her ability to be a good sport. "I love what I do every day which includes developing a partnership with horses. I believe that in order to be a good sport you need to enjoy spending time with horses and feel lucky that you are outside in the beautiful Florida sun. I know I feel lucky," she said. During the show Later competed Navarre D, an Andalusian owned by a client in Texas, in the Fourth Level Test 1 class. "He did fantastic in his trot work and most of his canter. We did have a couple of little mistakes though," she said. Despite the mistakes, Later smiled her way through the test to become the recipient of the Premier Equestrian Sportsmanship Award and the winner of a $100 gift certificate from Premier Equestrian. "I am pleased to welcome Nancy as a Premier Sportsmanship Award winner. Sportsmanship is an important part of competition, and Premier is pleased to be able to highlight it through our award," said Heidi Zorn, President of Premier Equestrian. Premier is considered America's leading manufacturer and distributor of dressage arenas and their website offers extensive and informative information designed to help horse owners understand the differences in arenas as well as horse arena footing. Premier supplied GGT Footing for the dressage arenas at the Jim Brandon Equestrian Center where the Wellington Classic Dressage Autumn Challenge Show was held. "Proper horse arena footing is a big issue and Premier has the answers to the most often asked questions when it comes to arena footing," Zorn said. Nancy Later, with Navarre D, shows off the smile that helped her win the Premier Sportsmanship Award at the Wellington Classic Dressage Autumn Challenge Show. Premier Equestrian, LLC, a leading supplier of dressage arenas, jumps, and stable accessories, sponsors the Premier Sportsmanship Award and the winner receives a $100 gift certificate from Premier.